To clarify, I’m not a true sidearm pitcher, more of a low ¾ angle at this point in my career. I always had a very low arm angle ever since I was a little kid – it just felt more natural for me to keep my torso level rather than tilted at release point. The exact angle has varied quite a bit over the course of my career, usually unintentionally and in response to other mechanical changes that I am working on. For me, I never tried to throw sidearm or drop down, it’s just how I naturally threw. If anything, I worked to improve my velocity for the majority of my career, which has resulted in a slightly higher angle – more like a Randy Johnson or a Chris sale than a true sidearm slot. my arm slot as a lefty was enough to play in the ACC) as well as professional ball (I was up to 95 mph my senior year of college, which again was enough when coupled with my slot). Lacking the velocity, I would have had to totally dominate and outperform everyone else, and still be given limited opportunities at the higher levels of the game – this is just the culture and the reality of professional baseball. If someone is sidearm, I don’t think they should just accept that they won’t ever throw hard. They should study what the hardest throwing side arm or low ¾ arm slot pitchers do, and try to apply some of those principles to their own delivery. Everyone is different, but the principles of physics apply universally. The one caveat is to pick somebody who is also of similar body proportions and body composition as you – if you are 5’6” don’t try to imitate Randy Johnson’s arm action because his anthropometry is drastically different. I’ve always been told my ball has some significant action on it – I don’t always see the action on each pitch myself, so I have to go off of what others tell me. At times during long toss my ball will move arm side by 20 or 30 yards if I am really getting on the side of the ball and I’m out past 300 feet with my throwing partner. When I stay a bit more on top of the ball I have better velocity and I still get movement, but not to the same extent. I’ve also found that the lower angle is particularly tough on lefty hitters, because I am essentially releasing the ball from behind them. Despite the assumption that this angle is only deceptive to lefties, I’ve actually found that opposing batting averages have been comparable between lefties and righties. It’s just overall a deceptive slot, on top of the fact that I have a good bit of upper body counter-rotation, effectively hiding the ball through most of my delivery. Because I never officially dropped down, this is hard to say. I think my unique motion has helped open doors for me and set me apart, but only because my velocity was comparable to other traditional pitchers. When two guys are throwing 90-93 - a righty with a straight fastball vs. a sidearm lefty with a bizarre motion and some movement, it’s clear who has the advantage. However, if I was in the mid or upper 80s range, I would really have to separate myself with pinpoint command, exceptional movement / deception, pitch selection and off-speed offerings to be given the same opportunities. This is a difficult question. I think you need to first establish your goal – is it to pitch in the major leagues? Get drafted? Or just be successful in your current collegiate or high school league before hanging up the spikes? If you are trying to pitch as a sidearm guy at the highest level, you need to look at what types of sidearm guys have made it. What type of stuff do they have? What is their command and offspeed stuff like? What kinds of numbers did they put up in college? The successful ones either throw low 90s or better with a solid second pitch, or there are a handful of mid and upper 80s guys who have really exceptional offspeed pitches and rely relatively little on their fastballs. But being a low 80s sidearmer generally means that college is the end of the line. If you’re okay with that, it really is incredibly tough on these hitters and could make you a valuable weapon on a college or high school team. I can’t vouch for true sidearm or submarine pitchers, but for low ¾ arm slot guys, it’s really about creating a smooth flow of energy from the ground up, and using the kinetic chain to your advantage. There needs to be a properly directed drive from the back foot through the front hip, transitioning into hip rotation while keeping the shoulders fully closed until landing. If you can get into the right positions then it’s just a matter of tying the whole delivery together via a smooth and efficient transfer of energy and learning to replicate that delivery with thousands of deliberate repetitions. I throw a 2-seam fastball and a slider. I prefer to focus on refining fewer pitchers rather than having 3, 4 or 5 mediocre offerings in my repertoire. I’m incredibly impressed by pitchers who are able to command 4 or even more big-league quality pitches – I don’t think most people appreciate how unbelievably difficult that is to do. I attack and challenge hitters by throwing my fastball over the plate. This generally works, especially at the lower levels of professional ball. As you move up the ranks, it becomes increasingly difficult to approach hitters in such a simplistic way, although you’d be surprised how much you can get away with if you just attack hitters and throw with conviction. I’ll mix in my slider down and glove side as a swing-and-miss 2 strike pitch, or in the strikezone as a get-me-over pitch earlier in the count. It’s different and unique. Again, though I’m not a true sidearm pitcher, I have a very different looking delivery. It sets me apart and establishes value (primarily because my velocity is in line with other pitchers). I’m still looking to add velocity, which I think is something that most sidearm pitchers have kind of accepted isn’t possible or is very tough to do. For me, this has been the game-changer, although again, it’s not the only road to pitching success. 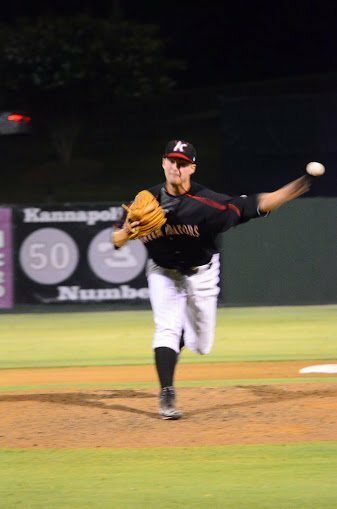 Ben Brewster is a professional pitcher and 15th round draft pick in the Chicago White Sox organization. He transformed himself from a 155lb high school pitcher throwing low 70s to a 6’3” 215lb college senior touching 95 mph off the mound and 102 mph from a shuffle step. He is the President and co-founder of TreadAthletics, an online performance coaching company dedicated to maximizing athletic performance through science and innovation.